Chloe the Dog (Inactive): Sigh. I love going to doggy daycare, but it always means a bath afterward. You poor thing, Chloe! 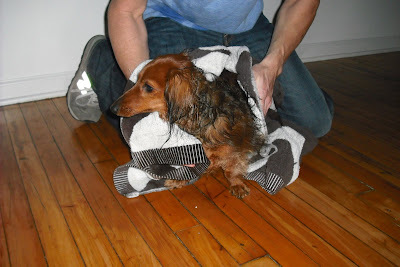 We don't like baths and we'll do anything to avoid them! YUK! Me has bath when I leave the dog park too!! It's too cold for me to have a bath, even though I need one. I bet you look all silky & shiny now.